Tapir: Can we analyse the following sequences which are shown somewhere on SL (and put together on the cap page by me) via tewari? I suppose some of them are not even at all. Herman: All of these sequences (1, 2, 3, 4) have been played in at least a dozen professional games, so I think it is hard to say that they are not even at all. 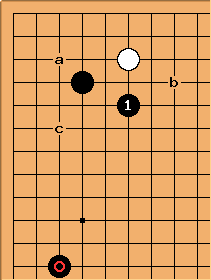 All the diagrams on 4-4 point Low Approach Cap do not have the hoshi stone on the left side by the way. 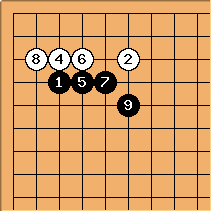 Herman: Yes, I've done my research into this play based on a 9x9 corner, ie without the hoshi. And as the "advice" diagram from "the direction of play" shows, it need not be there for this move to be played. 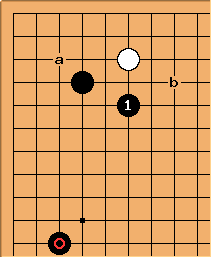 I've checked the move against GoGoD (2007 summer ed, I've got the 2008 winter at home, but have not installed it yet). After the invasion at 3-3, black split white's stones 87 times, and blocked on the left 65 times. 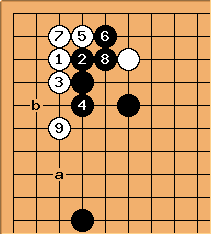 After the split, black played hane ( in sequence 3) 48 times, and extended ( in sequence 4) 34 times. After the block on the left, in sequence 1 was the most popular continuation at 24 times, in sequence 2 was played 17 times. 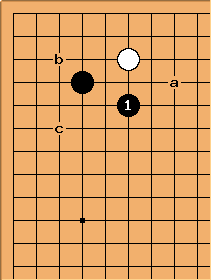 Tapir: I read Takeo Kajiwara as saying: A framework should be build with this move otherwise it is irregular. 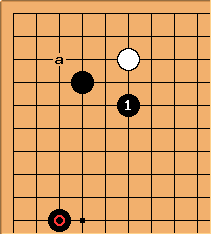 His example is without a stone at or near the hoshi, but his point isn't that you don't need a stone there, but that the cap is playable only under certain circumstances and that it fits nicely in the given game. 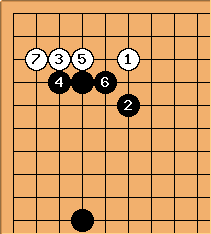 PS I have no joseki dictionary or sth to this end, so if the sequences are indeed joseki I'll be quiet. But in sequence 1 still looks odd to me (but maybe this is the only sente sequence available). 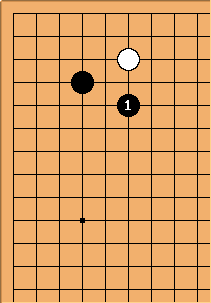 Tapir: Can you check how many times out of the 369 games the cap was played there was a stone at hoshi or near by (on 11-4)? Herman: So about half these games have a stone on the 10th line, and about 1/3 have a stone as far away as the 12th line or further. 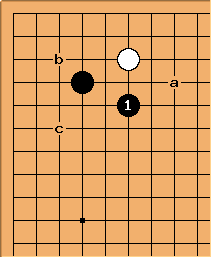 Invading in the corner is the move of choice when black had a stone along the left side, but extending is the move of choice when black does not. Tapir: looks very odd placed. 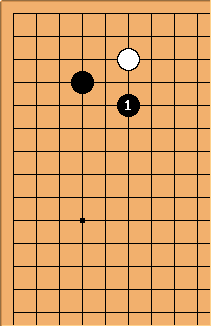 Tapir: This looks better, but white has some aji to invade or to cut directly. 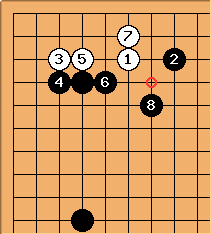 So I believe this is worse than the joseki after the low 1space pincer. 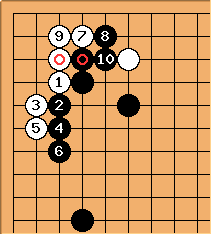 Though black is stronger towards the right than in the pincer joseki -> but this isn't the major direction? Tewari? fractic: White might not have as much aji on the left (although I'm not even sure about that) but she does have the push at . 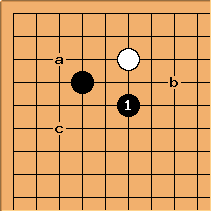 fractic: Black also has the cut at to worry about here combined with the relatively small number of liberties of the stones I'd say there is quite some aji. An invasion on a could work with some support nearby. So I'm not really sure why you think the other position is worse for Black. tapir: Don't mind, I'm weak. It was just my impression. JG: Just for accuracy. 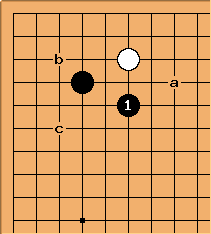 A White stone at could be captured by a black reply at b. I agree that Black's shape is clumsy. Tapir: I'm not sure about this. 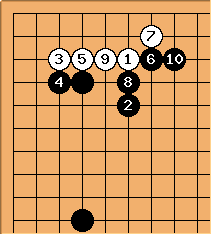 Looks like a known joseki + 1 unreasonable stone by each player. 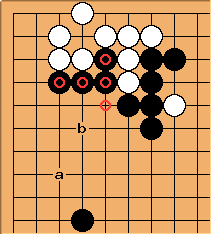 unkx80: Given the 10-4 stone, blocking at is wrong direction. Herman: Well, it depends on the position along the top. 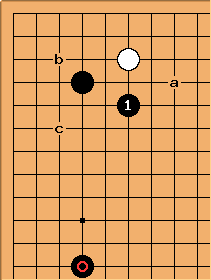 With a white position along the top, I agree, but if black also has a stone on the 4-10 hoshi along the top, may be the right direction. 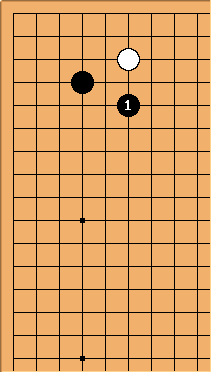 Tapir: This one is reasonably similar to a known joseki. 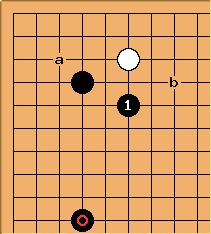 Black has a nice follow up at a (threatening b). Tapir: According to 3-4 point distant low approach tenuki, at is usual for a very different sequence. But that doesn't matter, I just want to point out how odd looks in this sequence.